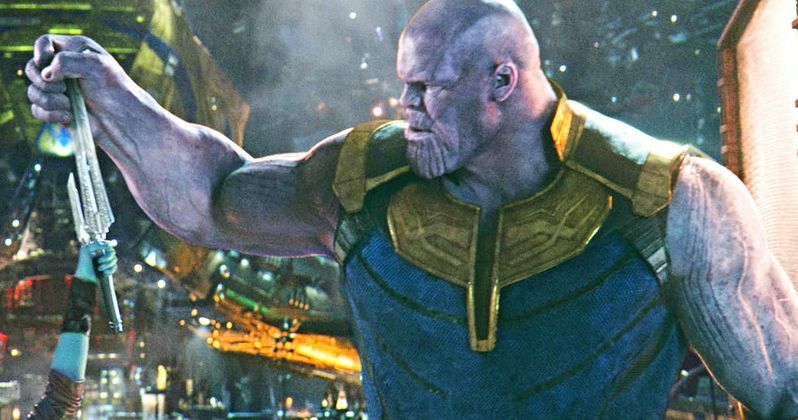 Josh Brolin's portrayal of Thanos in Avengers: Infinity War is one of the highlights of the movie from an acting standpoint as well as from a visual effects perspective. The villain is completely CGI with Brolin wearing a motion capture suit, which might have initially been a tough sell to company executives. However, Marvel Studios recently released the test footage that they shared to the executives in order to get filming approval and it's pretty amazing. The villain is nearly identical to how he appears on screen. In the short test footage clip, Josh Brolin comes to life as Thanos. While the look of the villain is astounding, especially considering that they hadn't even started officially filming yet, Brolin's acting is a bit more animated than the subdued and calm Mad Titan that ended up in Infinity War. Other than that, it's easy to see why the company executives liked what they saw. The footage shows the Mad Titan having a conversation with Loki, who is not seen. The villain even makes a joke about having to snap the character's neck. In addition to Josh Brolin's exaggerated body movements, the voice of the character is also somewhat different than what ended up in the final cut of Infinity War. There appears to be some pitch shifting audio software being used to deepen Brolin's voice. The Russo Brothers ended up going with a natural approach to the voice, which makes the character even more sinister. The pitch shifting on the voice in the test footage is almost too much, even though it's subtle. Infinity War gave Marvel Cinematic Universe fans their first real look at Thanos, giving much of the film to him. The Russo Brothers along with screenwriters Christopher Markus and Stephen McFeely have stated the movie is a "hero's journey" for the Mad Titan, noting that the audience often feels empathy for the villain. Helping that feeling is Josh Brolin's understated vocal performance led by a less-is-more style for the physical aspect. Thanos is slow and deliberate, even while he's fighting. Each move serves a purpose and no energy is wasted, even when he's taking down the Avengers in Wakanda at the end of the movie. Infinity War set Thanos up to be the most powerful being in the universe, which doesn't look good for our heroes who are gearing up for battle once more in Avengers 4. It's still a mystery as to how some of our favorite heroes will be able to come back after the mighty snap, but there are plenty of rumors and theories floating around from Doctor Strange giving up a fake Time Stone to a second Infinity Gauntlet being made with a journey through time to get the Infinity Stones before the Mad Titan. Regardless of how everything is going to happen, it's going to be a visual spectacle on the big screen thanks to the hard work of the visual effects team. You can check out the Thanos test footage below, thanks to the MCU News Twitter account.